Delaware county events are made special and memorable when you book Delaware County's top magician - Rick Dz from DZ Magic. In Chester, Drexel Hill, and all over the area, event and party planners are happy to choose Rick Dz and DZ Magic as the solution to their entertainment needs. Rick's been providing laughs and magical "wows" at Birthday parties, family celebrations, and festivals for years. Funny routines like the mysterious "knotty silks" provide many laughs per minute, another effect puts the magician in real danger, and mindreading and other psychic experiments probe the boundaries of human knowledge. DZ magic will design a magic show for you and your celebration based on the ages and desires of the audience Rick's magic show is 100% clean but the balance between silliness and light-hearted sophistication is selected just for you. If you'd like your party to be simple and fun, call 215-948-2658 and arrange a show with DZ magic today. Visit our home page to see all the various types of shows we offer, or jump straight to our special page all about birthday party magic. Rick learned magic from some of the top national magicians, and has taught magic to Delaware County young magicians since 2005. Rick is not satisfied with classic tricks and the standard patter -- he seeks and creates new illusions and tricks that haven't been seen anywhere else. Hire Rick to showcase these miracles at your event in Delaware County PA and you'll be the talk of the town! Whether it's a birthday child, grandmom, a special volunteer, or anyone else you'd like to honor, Rick will ensure that effects are built into the magic show which makes them the star of the show. They will have the opportunity to get up on stage and personally make the magic happen. This is a wonderful photo opportunity and will be remembered forever! Book Rick DZ today and make your child's birthday party one he/she will remember for a lifetime! My magic show includes comedy magic, almost non-stop laughter, and plenty of audience participation. This is a very special day for a VERY SPECIAL person. Your child will be a special helper and they will come up and "assist" me by holding the magic wand and other props, but most importantly, to their & their friends eyes, they are making the magic happen. They might even float in the air. The magic words that everyone shouts will be "Happy Birthday, NAME!" All this makes your child the star of my show. Kid's birthday parties are my primary focus, so I have become the "expert" in this area. It doesn't matter what kind of entertainment you need for your child's birthday party. In addition to providing my top-rated magic show, I can also supply you with face painting and balloon animals making my company your one-stop business for all your kids entertainment needs. I tailor my magic shows for different age groups. Things that work extremely well for some ages will not work for all ages. Therefore, based on the age of the kids attending your party they will see a variety of different magic tricks. All of my magic shows are customized and include a bunch of comedy and audience participation. I believe it's super-important to keep all the children laughing and involved in the show from start to end. They'll all help with some things and volunteers will come up and assist me during my show. During birthday parties, your birthday child will always be featured and will feel like the star of the show! I am also available for any type of Delaware County event that needs children's entertainment, whether it's a festival, a Blue & Gold banquet, a library show, a summer camp show, or a holiday party. 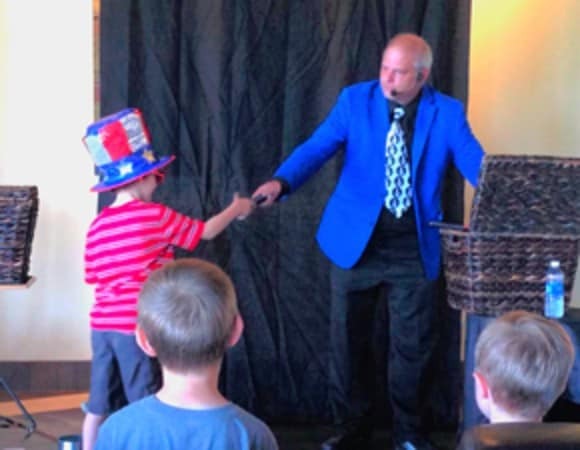 Yes, I even do magic shows for adults -- I recently did a birthday party for a woman who was turning 80 years old, and she loved it as much as 8 year olds do! Contact me for full details on how I can help make your party or event successful AND unforgettable! Planning a birthday party in Delaware County PA? Want an fun and super simple idea to entertain the kids? How about booking a birthday party magic show? These shows are usually 30 minutes or an hour and are a great way to keep a bunch of children not only occupied, but truly engaged! The show is interactive and empowering for children, and the birthday child "performs" a lot of the magic and is the REAL "star of the show"
With this kind of magical party entertainment, all of your guests will have an truly fantastic experience and you'll basically be a superstar parent because your child will be the star of a their very own magic show. All the kids (and parents) will have a fantastic time and will remember it forever. It's Hilarious! Funny! Memorable! Astonishing!